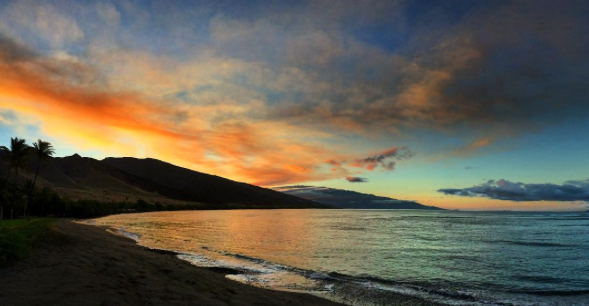 Ah, the magic of Camp Olowalu. 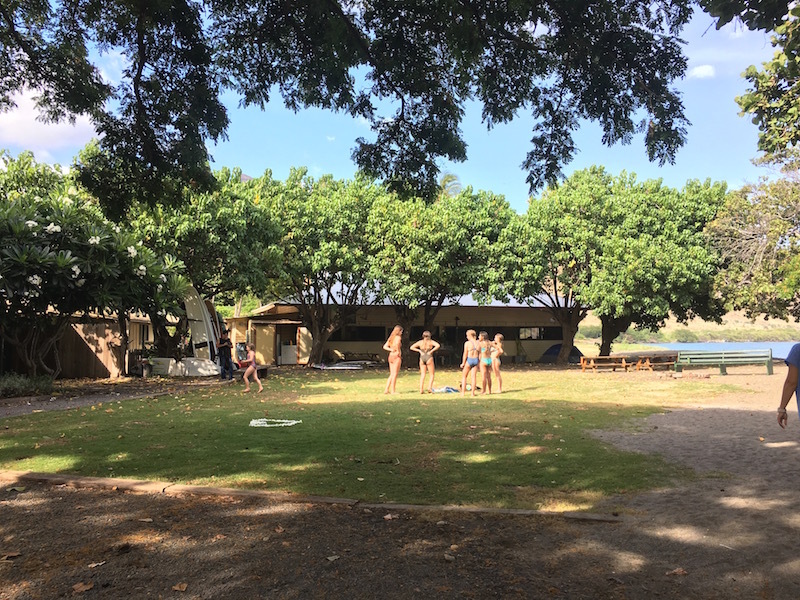 Maui Surfer Girls has running our teen camps there since 2001, and a couple years ago added on our women’s camps. 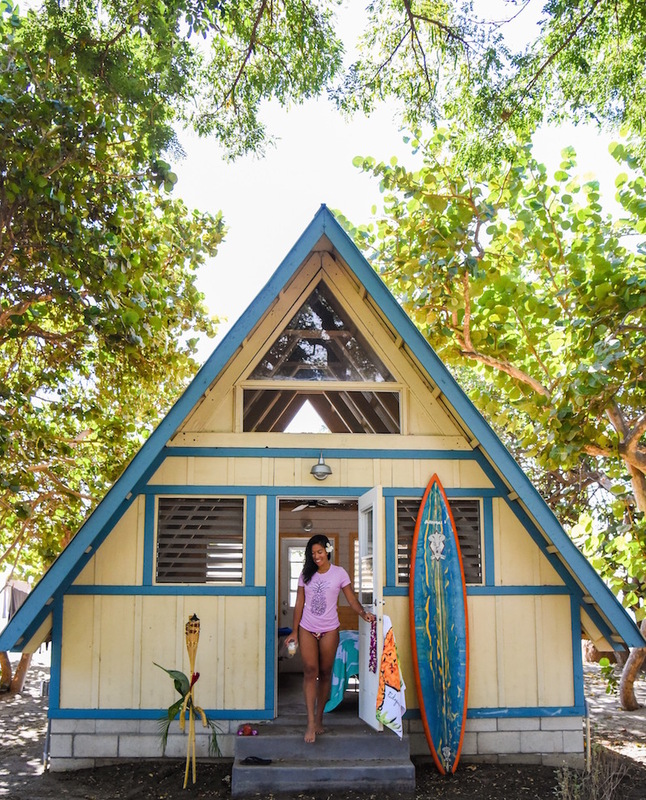 Camp Olowalu is the perfect set-up and location for our surf camps, only a few miles from our main surf break, and close to town and the airport, but with a remote, back-to-nature feel! 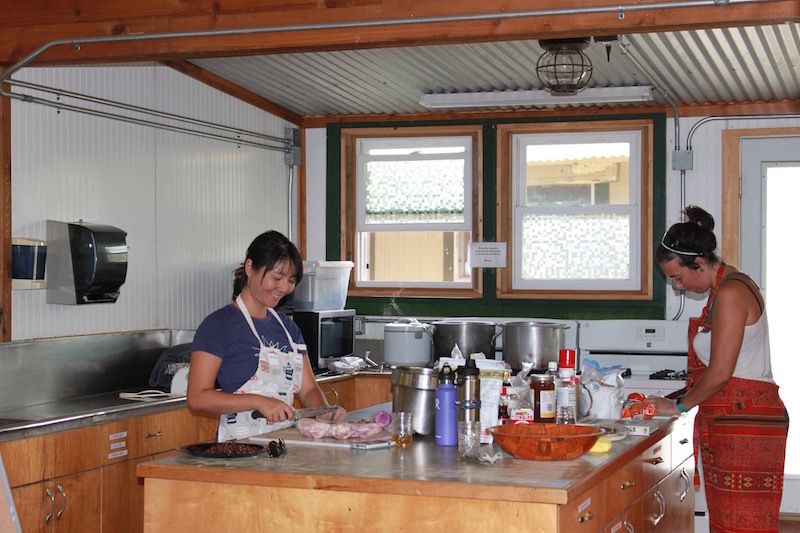 Camp Olowalu has been expanding every year, adding tentalows, tent and car camping, but our camp is based out of the Cabin section. 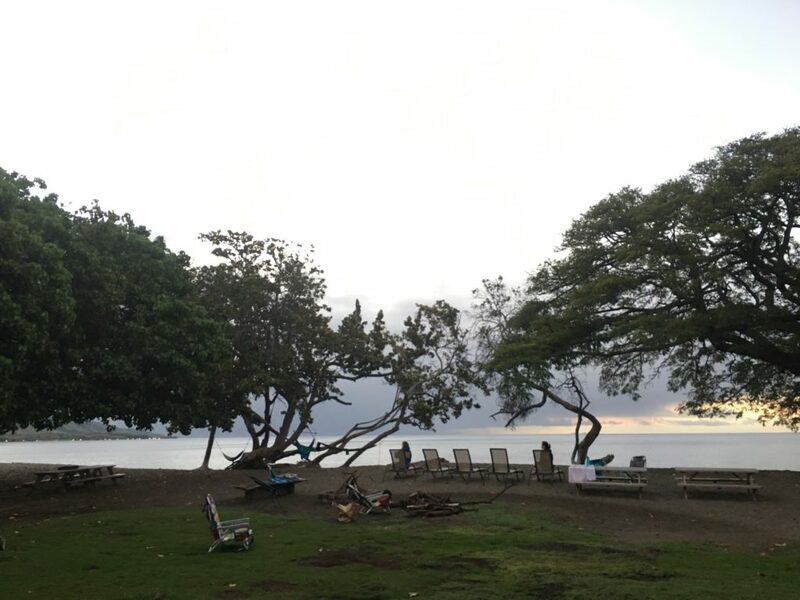 This is our section of Camp Olowalu, with cabins on the right, the mess hall and bathrooms on the left, and the ocean out front! The Cabin section includes 6 spacious cabins, complete with lights and ceiling fans. 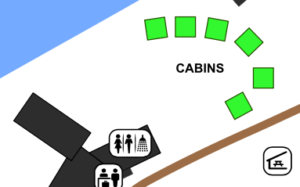 The teens share the cabins between 6 girls, and the women’s camps are limited to 3 in a cabin (with queen sized, raised air-mattresses provided!) Bathrooms with plenty of toilets and showers (even an outdoor one!) and a large kitchen and dining hall area. Of course, the highlight of the camp ground is that we are directly ON the beach. It’s a nice sandy beach, just a bit rocky, and the water is warm and clear! 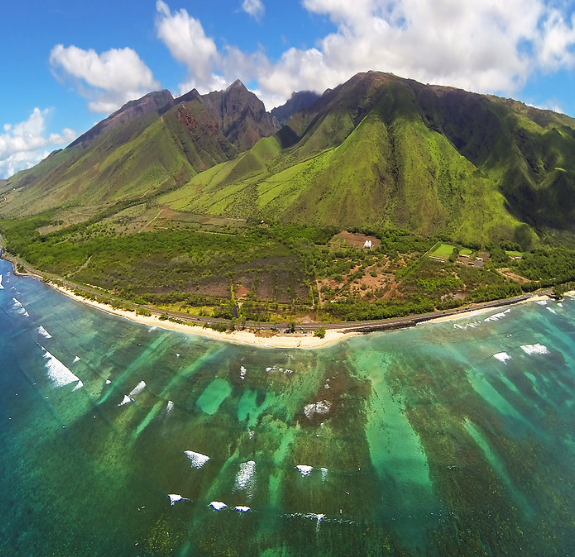 The reef is fairly shallow, so it’s not the best for swimming, but snorkeling and stand-up paddling are great options right off our beach. 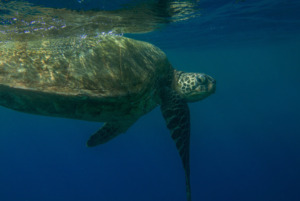 Turtles are frequently spotted just a few feet from shore! And in the winter, it’s a great spot to watch the humpback whales! The mother whales love to come into the warm shallow waters with their newborn calves. 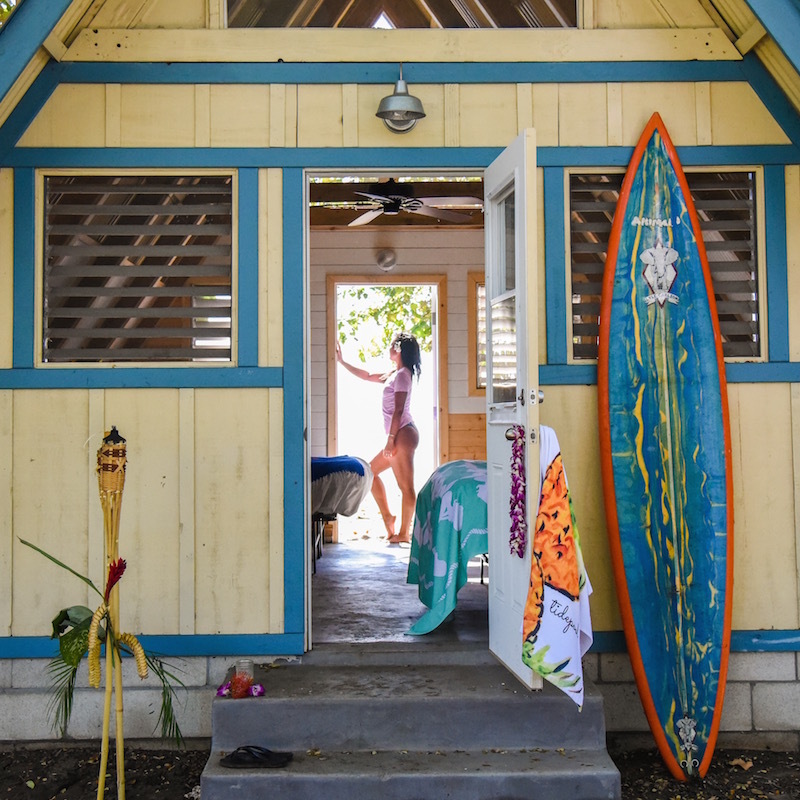 Camp Olowalu, which used to be called Camp Pecusa, is special to our founder Dustin Tester, not just because of the past 17 years of surf camps, but because of her family’s involvement with the early days of the camps! 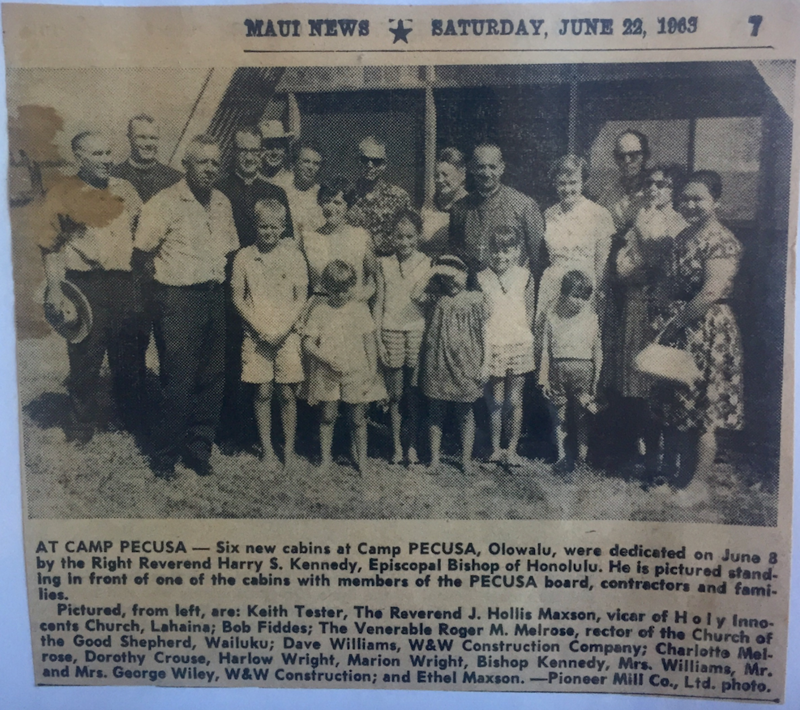 In 1963 my grandfather, Keith Tester, helped build “Camp Pecusa”, present day Camp Olowalu. As plantation manager of Pioneer Mill in Lahaina, Keith helped set aside plantation land alongside the Olowalu coastline to build 6 A-frame cabins and a dining hall. Apparently the dining hall was an old plantation structure from HC & S plantation in Kahului that they transported on a huge truck through the Pali tunnel to Olowalu! Keith Tester, Dustin’s Grandfather, is on the far left! My father attended Boy Scout camp shortly after Camp Pecusa was built, and when I was ten, I attended an Episcopal church camp there. I remember being so homesick because my dad was in Lahaina and I couldn’t see him for a week. Little did I realize that seventeen years later, I’d run my own summer surf camp. The rest is MSG history! 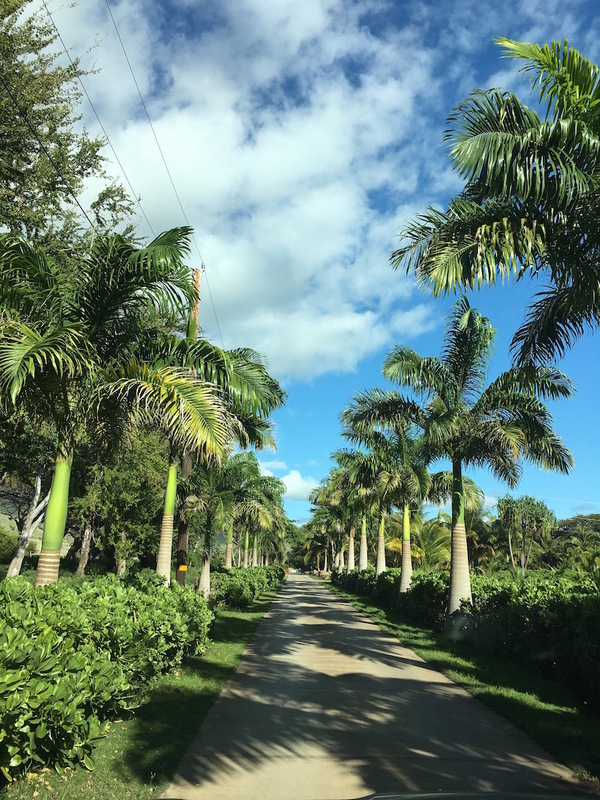 The entrance to Camp Olowalu is always so inviting!!! 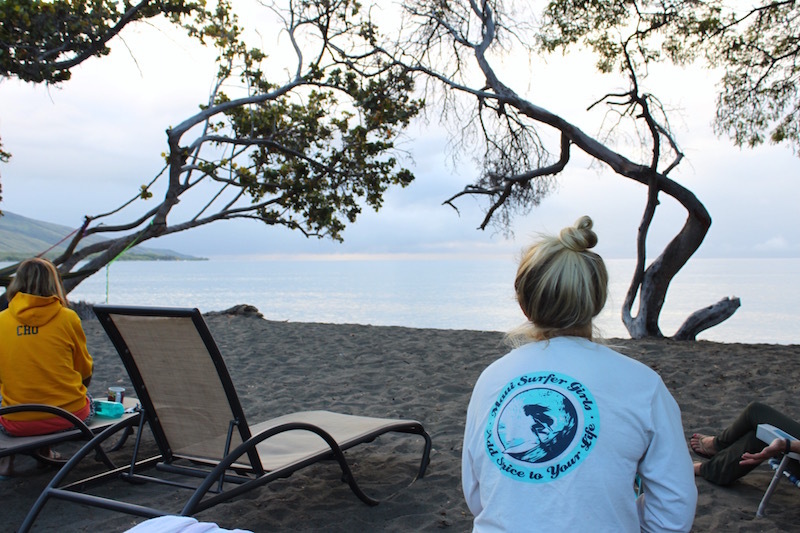 The cabins have been recently upgraded… Kat Gaskin checks out the ocean view from her back door! 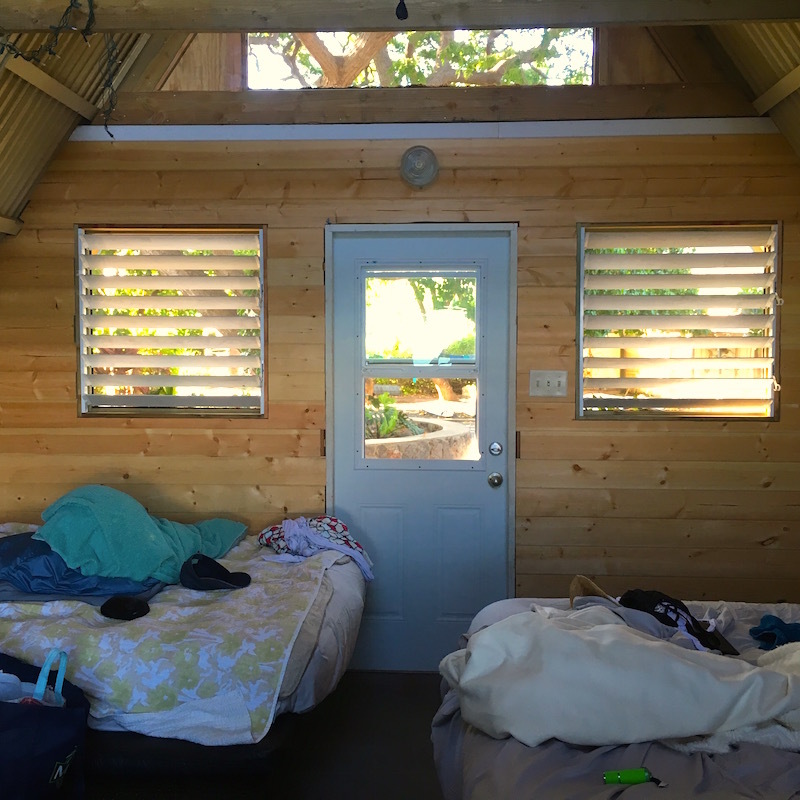 For the women’s camp, 3 women are in each cabin, with raised queen air mattresses! 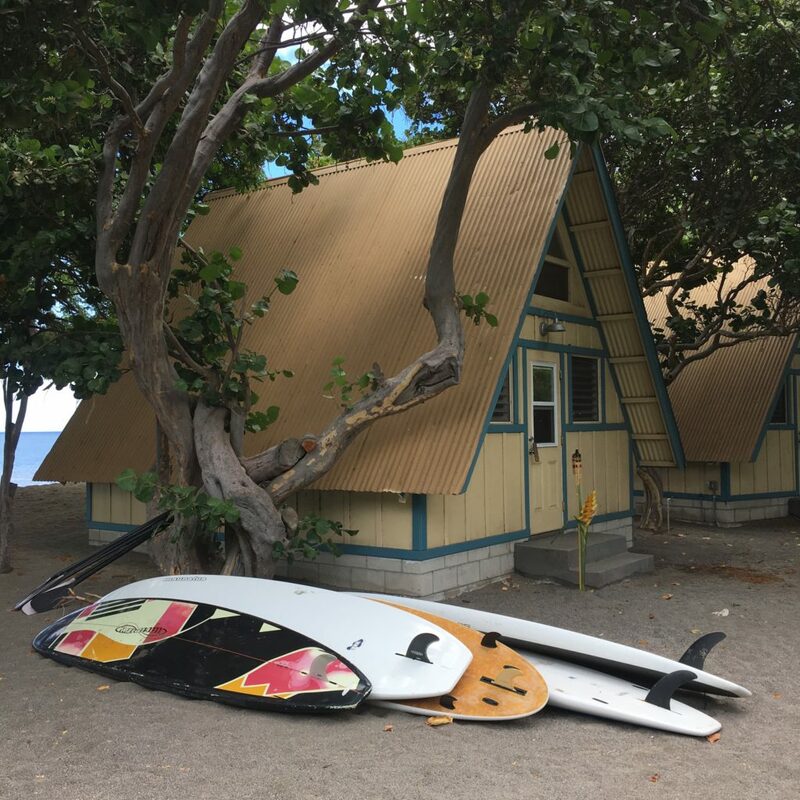 Camp is always stocked with SUP boards, snorkels, hammocks… for whatever activity you are feeling up for! Good things are always cooking in this kitchen! 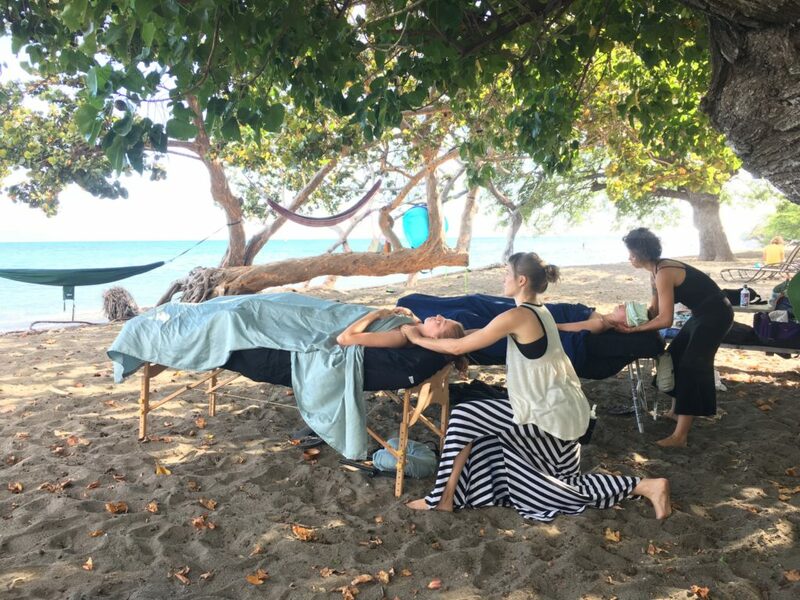 After a few mornings of surfing, beach side massages are always appreciated by our women’s campers!